Randy Larson began his firefighting career with the Amarillo (Texas) Fire Department in 1981. Randy retired after 25 years to take a position with the Upper Pine River Fire Protection District in Bayfield, Colorado as Deputy Chief of Operations and Training. After 8 years Chief Larson moved to the Pagosa Fire Protection District in Pagosa Springs Colorado where he holds the position of Fire Chief. 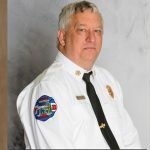 Chief Larson has a degree in Fire Protection Technologies from Amarillo College where he also was an instructor in the Fire Academy, Hazardous Materials Academy, Environmental Protections Department and the Lead Instructor in the FPT Degree program. Chief Larson set on the Board of Directors with the IAFC/VCOS from 2013-2017. Chief Larson has been working with the SH&S Section on the Bullying, Harassment, and Violence in the Workplace task group since its inception. Chief Larson, being a thyroid cancer survivor, will work diligently to better the safety of all firefighters and work to help those that are diagnosed with a fire service related cancer receive the care and support that they deserve. Fire service cancer is a growing epidemic and needs to continue to be on the front lines of our battle our firefighters health and safety. We need to make it easier for firefighters and families to receive immediate support through Worker’s Compensation by enhancing the “presumptive” designation so that it is clear and understandable. Chief Larson will work diligently to support the goals and objectives of the Safety, Health, and Survival Section.